Team Ninja prides itself as not falling into the groove of only participating in one type of event/race. In fact it's against our motto: Get up and do something new! So, you will see some typical road races and obstacle course races (OCRs), but you also find some boot camps, parkour jams, TKD workouts, MMA fights, rock climbing, bike rides, cookouts, and anything else that we can think will be fun. Have an event that you want to suggest? Contact us and let us know about it. 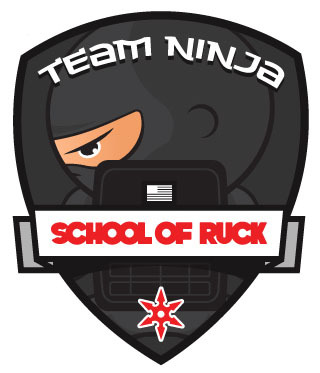 What is the Team Ninja School of Ruck? The Team Ninja School of Ruck program is open to any Ninja family willing to put in the effort to earn the patches and complete the year-long program. This program is designed to get families off the couch and working toward a goal of earning patches, together. Every 90 days, Master Ninja will release a new set of 10 Action Goals. The participants will have 90 days to complete at least 8 of the 10 Action Goals in order to complete this session. Participants will record their progress on the Student Log printout. Upon completion, parents will sign the log and mail it to Team Ninja HQ. 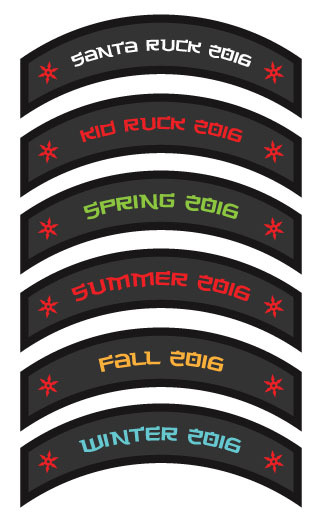 Master Ninja will review each completed log and participants will be mailed out their session rocker patch. Families can also participate in the 2 team events; Santa Ruck and Kid Ruck. Participants will receive the SoR team patch with their initial registration. There will be 4 quarterly sessions, plus 2 team events that they can earn a rocker patch; Winter, Spring, Summer, Fall, Kid Ruck, and Santa Ruck. The cost for entry into the School of Ruck is $10/participant or purchase a family pass for $25. This allows to participate for the entire year and to earn as many patches as they can in that time. All proceeds will go to the annual Santa Ruck donation to Riley Children's Hospital. We would like to thank Lyell Peterson (Team Spearhead/Pathfinder Program) and GORUCK Headquarters for their help/inspiration in putting this program together. We wouldn't be able to do this without your support.